Match is one of the most successful dating services in existence, and they offer specific apps and a website for people living in the United Kingdom. Match UK offers you several different ways of finding people who you might be compatible with on a romantic level. 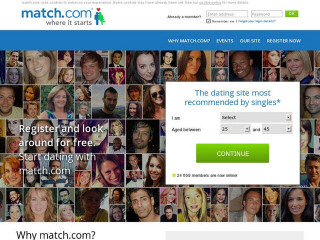 Match.com doesn't make users complete a lengthy personalty questionnaire - but the option is there if you want it. Match.com's brand has expanded around the globe and they now offer portals and mobile apps specifically designed for other countries and in several different languages. Following it's success in the US, Match is now the leading online venue for meeting new people in the UK as well. Creating a profile on Match UK takes no more than a couple of minutes. Unlike many generic dating apps, Match.com UK has thoughtfully tailored their service towards people in the UK with billing in sterling and post code searches. Creating a profile takes no more than a couple of minutes. There's no form to fill in. Simply visit the home page where you'll be greeted by a virtual assistant with an easy "phone style" messaging box. You'll be asked a few questions to which you reply by clicking choices from a list. It then prompts you to upload a photo either from webcam or from your device. To save time you can link in photos from your social media pages. When editing your profile, choose a few hobbies from the list. Once you complete this step you'll have the essential elements of your profile already completed. You can refine and add more to your profile at any time by clicking the icon on the right of the screen and choosing "Edit my profile". Top tip: When editing your profile, choose a few hobbies from the list. When someone views your profile they'll instantly be told if you both have things in common. On Match UK you'll find people looking for both long term and short term relationships. Not wanting to loose out to eharmony, Match offers a separate service called Affiny. Affiny is a full matchmaking service and you'll be taken through a lengthier personality questionnaire. In the U.S., a similar feature is available via the site Chemistry.com. Match.com is constantly innovating new ways in which its members can better find and connect with one another. They've recently streamlined their layout and removed some of the lesser used features. It's now considerably easier to use. Incognito let's you surf around the site anonymously without leaving any trace. Shuffle: This page shows you people one at a time who match your basic preferences. You can swipe yes or no to each photo and Match will use your choices to improve who it suggests to you. Search: The search feature gives you more control. You can select from a range of criteria including physical appearance, personal life, work life, hobbies and most importantly what they are looking for in a relationship. Discover: This screen will show you people who've been recently active and who match your basic likes and dislikes. Events: Go to the events page to sign up for singles events in your area. While the free account on Match UK does give you a reasonable amount of access, there are things you won't be able to do. One of these is messaging. To send and read messages you will need to subscribe as a paying member. The three packages they offer are basic, discover and unlimited. In addition Match offers some extras, for anyone willing to pay more. Boost highlights your profile and makes it appear higher up in searches. Unlimited is the premium package and it allows you to use the site without ads and gives discounts on singles events. Match.com is a highly successful dating website and with their massive global database of eligible single members, your chances of meeting someone through the site, wherever you happen to live, are that much greater than with a smaller less established dating service. Rss Feeds. Subscribe to comments for this site. [?] Receive updates about Uk.match.com directly through your newsreader. Like any dating site everyone is just waiting there to be contacted because they don't want to pay and in the end no one gets contacted. How genuine is someone's profile? Can a person just put down what they think they want people to like? Match.com UK 2.33 6 A review of Match UK. Match is one of the most successful dating services in existence, and they offer specific apps and a website for people living in the United Kingdom.